This 2016 Jeep Renegade graphics kit is inspired by the OEM factory 2017 Jeep Renegade hood decal style look, but you certainly don’t pay factory prices for these top quality vinyl decals! The Renegade Jeep Trailhawk hood decals racing stripes for the 2014-2019 jeep renegade have been pre-cut to perfection from top quality auto-grade vinyl to ensure that you get a professional finish that will last for many years to come and we give you our guarantee on that! 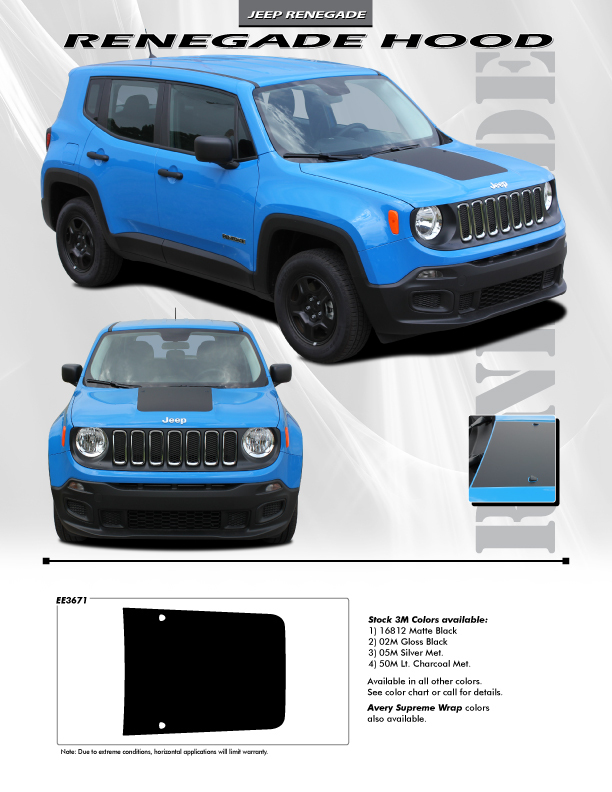 The 2014-2019 Jeep Renegade hood Trailhawk style vinyl decal graphic stripes kit has been cut from 3M high performance automotive grade vinyl and it comes with a 7-year vertical and a limited horizontal warranty. We cut all our vinyl decals and stripes kit using state of the art techniques so that you get and easy fit every time. The Renegade hood vinyl decals stripes are simple to install, straight out of the packaging, and we’d be very surprised if you have to do any trimming at all. When you buy Jeep renegade vinyl decals from us, you get best quality Jeep vinyl stripes, free delivery, and we usually ship all our orders within just twenty four hours of receiving them.